The new season may only be a few weeks old but the Top 14 has already suffered its first managerial casualty with the news that Australian Ewen McKenzie has been sacked by Stade Francais. Stade president and owner Max Guazzini made the announcement at a press conference on Tuesday afternoon, thanking former Waratahs boss McKenzie and assistant coach Christophe Dominici for their involvement with the club before showing them the door. "We have already stated that the message from the coaches wasn't really getting through and we have decided to make a change, with the agreement of Ewen McKenzie and Christophe Dominici," said Guazzini. Former Biarritz coach Jacques Delmas and ex-Brive and Agen boss Didier Faugeron will take charge of a club mired in crisis after a catastrophic start to the season. Sunday's 30-22 defeat at the hands of Biarritz was the final blow for McKenzie and former France international Dominici. Delmas and Faugeron will be charged with the responsibility of getting the club back towards the top of the table as quickly as possible. The Biarritz result left them lingering in the relegation zone with just one win and a draw so far this season and over 150 points conceded in just five games. The disastrous run of form came despite the club spending big money bringing in internationals Tom Palmer, James Haskell, Julien Dupuy and Hugo Southwell. They did however lose Juan Martin Hernandez in the off-season and France international Lionel Beauxis has failed to deliver in his place. It is thought that Dominici will stay at the club in a different capacity. 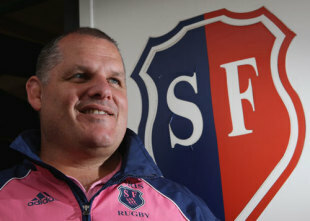 He has a minor shareholding in Stade Francais and has been with the club as a player and coach since 1997 but firing McKenzie will not come cheap for the Parisien club. The Australian was thought to be under contract until next summer so any payoff would likely amount to several hundred thousand Euros. Meanwhile, the Ligue Nationale de Rugby has announced new dates for the two fixtures postponed due to a swine-flu outbreak in the Castres camp. Castres will now play Montauban on September 16 and Albi on September 29.